Mocean USSD Gateway is a robust yet flexible solution that supports USSD Phase 1 & Phase 2 capabilities. Enabling Mobile Operators to immediately launch USSD based interactive services. As USSD is already supported by the mobile network elements, there is no need for any upgrades of the switches. When a Mobile Subscriber requests for services via USSD, the request will be routed by the HLR to the USSD Gateway. Based on the USSD Service Code (or other routing settings), the USSD Gateway will route accordingly to the respective service application. Mocean USSD Gateway enables easy roll out of interactive services by providing standard interfaces such as XML, SMPP, HTTP and HTTPS to service applications. Mobile Operators can either develop their own services or take the option to open up the interactive services to external application services providers. 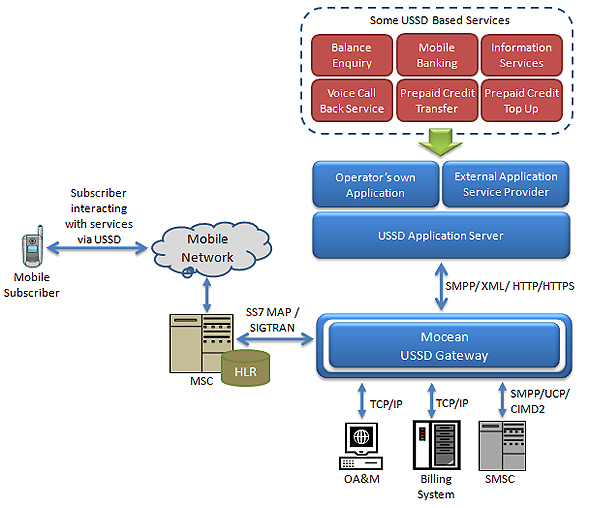 Mocean can also provide a suite of USSD based services for the Mobile Operators to offer services. As USSD Phase 2 is supported by the Mocean USSD Gateway, Mobile Operators can also choose to implement “push” based USSD services. Mocean USSD Gateway also comes with a USSD Menu Creation tool that allows Mobile Operator to easily create menu and edit it accordingly as required. As the menu is only presented by the USSD Gateway to the subscriber, any changes does not require any updating action by the Mobile Subscriber, ensuring a smooth and transparent service delivery. On the network side, Mocean USSD Gateway has SS7 MAP or SIGTRAN capabilities that enable it to translate subscriber’s requests to the USSD application and vice versa. It can also connect to other elements in the Mobile Operator’s network that could be required to implement the USSD services such as the SMSC, OA&M and Billing system. Being a complete solution, Mocean USSD Gateway provides Mobile Operators the ability to broaden their service offerings by launching new services easily and quickly. This enables Mobile Operators to differentiate themselves in the current competitive global mobile service industry.